Show me your characters whose name and/or pronouns people always get always wrong! Because we all know that's the kind of thing that happens, be it on the website itself (esp. forum games), off-site, or even in real-life! Are some characters of yours more prone to this than others, and why/how? And how do you usually reacts when it happens? I SWEAR I have had a lot of situations of people writing my OC names wrong (without it being just a simple typo) but all I can remember is Kipinä? People usually write her name as Kipin or Kipina, and although the latter one is I Valid because not everyone has Ä in their keyboard, it doesn't change the fact that's an entirely different name and that Ä isn't actually just a fancied up A haha. But I understand it because not everyone knows how it's pronounced or how big the A/Ä difference is. Other examples for characters being refered with the incorrect pronouns include Beast (They were referred with gendered pronouns, despite being genderless), Sakura, Vetitum, and Catherine. solis strictly uses they/them, yet i keep messing up & using he/him or she/her for them^^;; i'll get there eventually solis, i'm sorry for messing up so often!!! I genuinely have no canonical pronounciation for this character's name, more or less, I like seeing how people would want to say it. Their pronouns are they/them but neither they or I mind if they're called a he or a she. 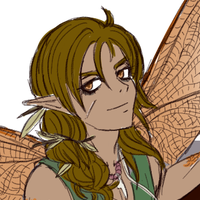 Aquila is the other one who sometimes gets their gender mistaken and with him it's a little more awkward, since he's explicitly male and my brain can't comprehend viewing him as a woman at all, though his appearance is sorta feminine. I get where it comes from but wow is it jarring and also not correct. - Yotaro has always and will always be referred to with they/them pronouns as they are a sexless agender,,, but back when i used them a lot on forum games literally 24/7 they were referred to with she/her or he/him,,, which honestly annoys me a lot??? since I've??? EXPLICITLY,, specified they go by they/them only?? - Affie,,, wE L L Affie hasn't been misgendered much but on one thread in particular someone said they look like a girl who's trying to look like a boy??? which kinda offended me but it's probably not that harmful??? Reading everybody else's comments is v amusing and also a big oof o)-( this is my boy, Omelette! People tend 2 assume he's a female because of his pink everything and genderless style- i don't rly mind too much bc i could see myself in their shoes making incorrect assumptions if i werent paying attention LOL, ppl also tend to spell his name like omlette/omelet or some other variation because of the way they initially spelt the word- even if the spelling for the word omelette is different in their language/mind, his name is still "omelette"
Tbh most of my oc's have been mistaken as girls at some point (they are literally all males tho) because I like my boys pretty, but Zoe in particular has gone trough that situation a whole lot, since he likes cute stuff and I often draw him wearing pretty dresses.